FREILASSING (Germany) (AFP) - Germany reintroduced border controls on Sunday after admitting it could no longer cope with a record influx of migrants, tightening the screws ahead of a key EU meeting on spreading the burden of the refugee crisis across the bloc. Within hours of Berlin's shock announcement German officers began carrying out the first passport checks near the border with Austria. 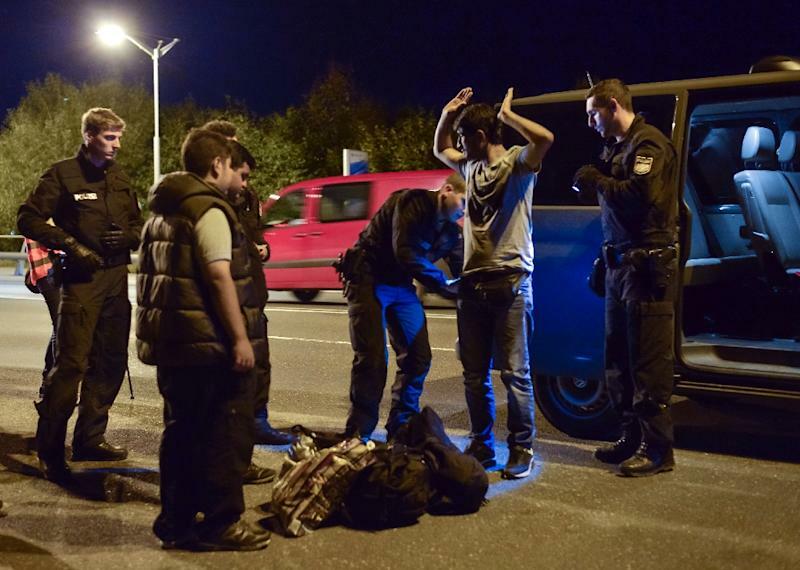 As night fell, police in fluorescent vests stopped all cars and pedestrians at the Freilassing crossing in Bavaria. Three Syrian men who were on foot became the first to be held back, an AFP journalist saw. The extraordinary scenes came on the eve of emergency talks in Brussels, where interior ministers are expected to lock horns over the European Commission's controversial plan to distribute 160,000 refugees around the continent. Despite an outpouring of public sympathy for the plight of the refugees, many of whom are from Syria, several eastern European countries have already warned they will oppose any binding quotas on absorbing asylum seekers. As the continent scrambles to respond to the biggest movement of people since World War II, Germany's dramatic reinstatement of border checks signalled a U-turn on Chancellor Angela Merkel's earlier decision to throw open the country's doors to Syrian refugees. The border controls effectively suspend Germany's participation in the bloc's cherished borderless Schengen system, one of the cornerstones of the European integration project since it was created in the 1990s. "The aim of this measure is to stop the current influx to Germany and to return to an orderly process," Interior Minister Thomas de Maiziere said. Asylum seekers must understand "they cannot choose the states where they are seeking protection," he told reporters, as Germany also temporarily halted all train traffic to and from Austria. Germany's actions were welcomed by Hungary's hardline Prime Minister Viktor Orban, whose own country is building a fence along its border with Serbia to keep migrants out. "We understand that this decision was necessary in order to defend Germany's and Europe's values," he told Bild newspaper. The Czech Republic said it would also boost security on the border with Austria. The sudden developments came as tragedy struck again off the coast of Greece, with 34 more migrants -- including four babies and 11 children -- drowning when their overcrowded wooden boat capsized in high winds. The images of hundreds of German police mobilising at the border piled on the pressure ahead of Monday's meeting of the bloc's interior and justice ministers on the EU plan to introduce compulsory quotas for admitting refugees. "The German decision of today underlines the urgency to agree on the measures proposed by the European Commission in order to manage the refugee crisis," the EU said. Preliminary talks between the EU's 28 mission chiefs on drafting a document for the ministers' meeting ended without an agreement late Sunday. The ambassadors' discussions are set to resume early Monday, an EU source said, adding that Hungary in particular was insisting on greater controls on the EU's external borders and for a higher number of migrants to be relocated. While Germany and France back proposals to help relieve pressure on "frontline" states such as Italy, Greece and Hungary, the quota scheme faces strong resistance from countries such as the Czech Republic, Slovakia and Romania. Czech Prime Minister Bohuslav Sobotka insisted his country would never accept compulsory quotas, saying the system "won't work", while Slovakia said it would try to block any such binding measures. Hungary, which reported a record 4,330 newcomers on Saturday alone, is meanwhile racing to finish a controversial anti-migrant fence on its frontier by Tuesday, when tough new laws will take effect that mean anyone crossing illegally can be deported or even jailed. For those already in Hungary, confusion reigned late Sunday over whether they would be able to enter Germany, the preferred destination of many of the migrants. "I do not want to stay in Hungary," Yusuf, a Syrian in his twenties, told AFP at a refugee transit camp in the border town of Roszke. "If they take fingerprints, will they make us come back here?" he asked. At the German border town of Freilassing, the three Syrians who were made to wait by the side of the road by police were eventually escorted to a nearby refugee reception centre. "We thought that Germany was the only country that would treat us like human beings," 27-year-old Hatem Ali Ahaj told AFP, adding that he and his 16-year-old brother and their cousin had been walking through Europe for 22 days. Under EU rules, the first country of entry is required to deal with an asylum seeker's request for protection, but Germany had waived the rule for Syrian refugees. While earning praise for its welcoming stance, German regional authorities have buckled under the sudden surge of migrants. In Munich, overwhelmed local officials said they were stretched to capacity, with more than 13,000 migrants arriving in the city on Saturday alone. Merkel, whose country expects to receive 800,000 asylum seekers this year, bluntly warned last month that the passport-free Schengen zone of 26 countries was under threat if the EU failed to work together on coping with the inflow. "If we don't arrive at a fair distribution then the issue of Schengen will arise -- we don't want that," she said. 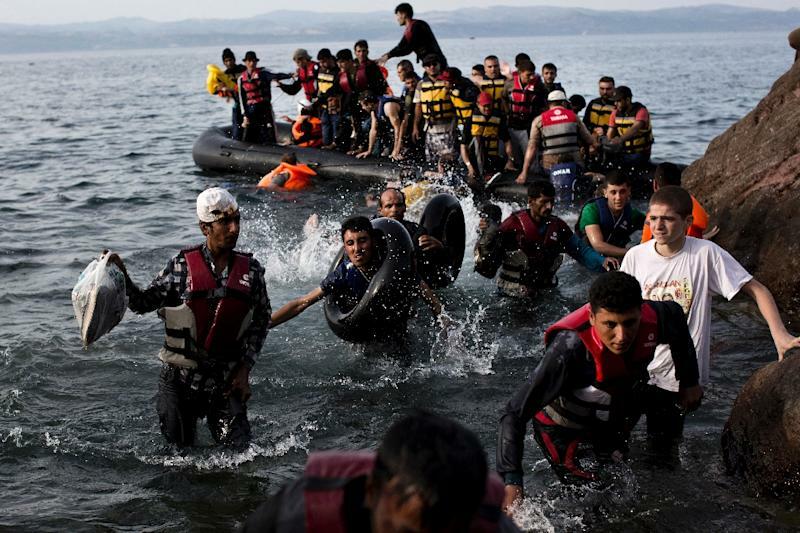 The International Organisation for Migration said Friday that more than 430,000 people have crossed the Mediterranean to Europe this year, with 2,748 dying en route or going missing. 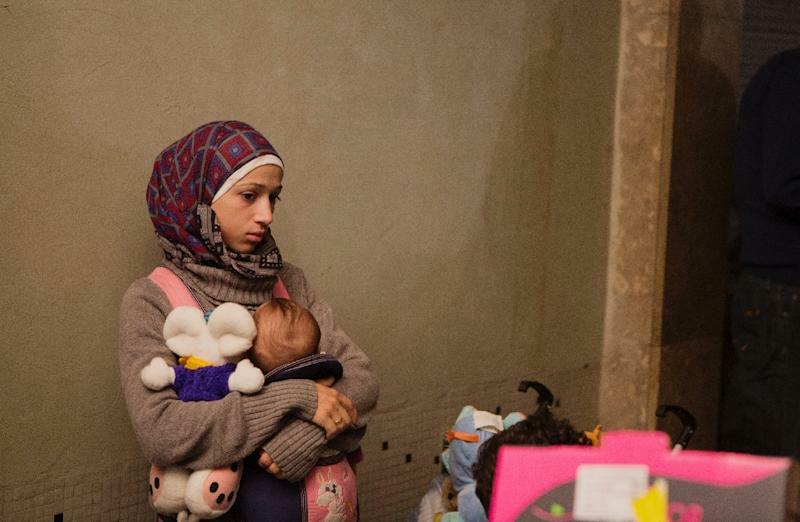 The 57-member Organisation of Islamic Cooperation meanwhile urged the United Nations on Sunday to consider a peacekeeping force for Syria to help stem the flow of people trying to reach Europe.